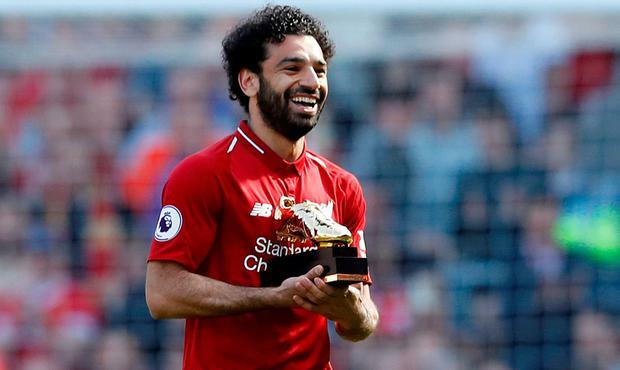 Harry Kane has challenged Mohamed Salah to deliver the goods again next year after the Liverpool man's record-breaking Premier League season. Salah broke the record for the most number of goals in a 38-game campaign when he scored his 32nd in Liverpool's 4-0 win over Brighton on Sunday. That saw him win the race for the Golden Boot, finishing two ahead of the Tottenham striker, whose double in a 5-4 win against Leicester took his tally to 30. That is Kane's best-ever return, though still not enough to win a third successive Golden Boot, after tallies of 25 and 29 in the previous two years, proving his consistency. And Kane has challenged Salah to repeat his goalscoring antics next year. "It's good to have competition, it's great for the Premier League to have two players at the 30-goal mark," he said. "Personally for me it was a target to improve on last year, obviously 29, and it was nice to get to that 30-goal mark. "For me it is about doing it year after year. This is my fourth year now and the first time I have got to 30 goals in the Prem, now it's about getting to 30 goals for the next two or three years, that's the aim. Kane's 30 goals helped Spurs to a third-place finish in the Premier League, ensuring a third successive year of Champions League football - an impressive achievement given they played their home games at Wembley and their top-four rivals spent heavily. Boss Mauricio Pochettino has appeared to challenge Spurs chairman Daniel Levy to match that spending this summer and "take risks" while also suggesting the club need to review their strategy if they want to start winning trophies. "It has been a good year," he insisted. "As a team to get in the Champions League was very important in the new stadium. "It's not been easy, especially playing here (Wembley) as well. "The top six now is so strong, everyone's really competitive, so for us to finish in the top three for a third year in a row is brilliant." Spurs said goodbye to Wembley in style with a frantic 5-4 win over Leicester, which denied the Foxes an eighth-placed finish. That did little to make the future of boss Claude Puel any clearer, but defender Danny Simpson is looking up. "We have finished ninth and we could have done better," he said. "There is always room for improvement. "We will have a break now and it will be an important pre-season to finish higher than ninth next season."